PORT-AU-PRINCE, Apr 4 2013 (IPS) - While Jean Reniteau mulls over the idea of using solar panels to light his house, Frantz Fanfan is wondering how to expand production of biomass briquettes to replace the use of charcoal in the cooking stoves of most of the Haitian people, who lack electricity. “At home we have a ban on cooking with charcoal. We have to put an end to this custom,” says Reniteau, a social communicator and university professor, while Fanfan, manager of a briquette factory producing ecologically friendly fuel in Port-au-Prince, says he wants to “stop deforestation” and aspires to flood the local market with his products. Reniteau does not know how long it will take to make his dream a reality. “There’s a company that sells and installs the panels. According to my calculations, it would cost me about 1,550 dollars. I’ll buy what I need little by little,” he tells IPS, explaining that his monthly income, equivalent to about 800 dollars, leaves him no other option. Renewable energy is making headway and its progress should be irreversible. 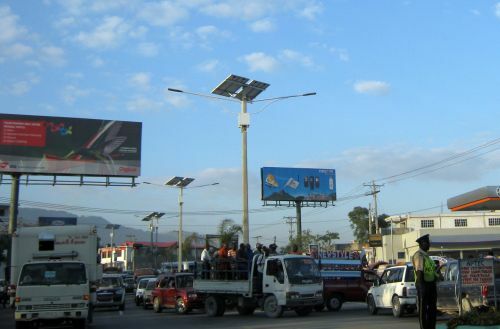 Toussaint Louverture Avenue, one of the main arteries of Port-au-Prince, is illuminated at night by solar street lights, as are other public spaces in the capital city and some towns in the country. The Fondation Nouvelle Grand’Anse, a local NGO, reached an agreement with Cubasolar to create in Dekade, five kilometres from the southwestern city of Jérémie, a centre of reference on renewable energy for the surrounding region and the whole country. “At present, our department (province) of Grand’Anse and the entire southwestern area have been declared a national priority,” activist Maxime Roumer, the head of the foundation, tells IPS. Over 250 street lamps are in the process of being installed in that region, which is slated to benefit from the use of biogas and other forms of clean energy. The main challenge in this impoverished country is to provide alternatives to charcoal, which represents 72 percent of national energy consumption. The fact that it is used daily by the majority of the people, who have no electric power, means that today forests cover only two percent of the country’s territory, creating a severe soil erosion problem. “If we don’t stop indiscriminate tree felling, in future even the mango trees we still have in our fields will be cut down and converted to charcoal,” says Fanfan, who argues that briquettes are the best choice for families to be able to cook their meals without harming the environment and people’s health. He points out that the briquettes are a cheap fuel, costing less than charcoal and propane gas, and are non-polluting and help eliminate city waste. “We are contributing to cleanliness in the country,” he said. El Fuego del Sol‘s factory produces 5,000 briquettes a day with a manually operated machine. The ingredients are basically cardboard, paper and sawdust, which are converted to pulp and placed in rectangular moulds to dry. So far they are meeting the needs of the World Food Programme (WFP) for fuel for some of the schools it assists. Children at the Saint-Joseph School in Fleuriot, a poor neighbourhood to the north of Port-au-Prince, have lunch each day as part of the school meals programme provided by the United Nations agency in several parts of Haiti. The school receives briquettes for cooking, as well as food for the meals. It also has a specially designed stove, donated by the WFP, which burns the ecological fuel. “We’re working on a prototype of a similar stove so that we can enter the national market with our product. Without it, people will use the traditional fire pits they usually cook on with charcoal, and they won’t appreciate the benefits (of the briquettes), they’ll think they’re no good,” says Fanfan. WFP sources tell IPS that Saint-Joseph is one of 29 schools that receive briquettes as well as food, in a programme that is still being developed with the view that it will be useful for agencies working on clean energy production. During this school year, the WFP is serving 2,142 schools in seven of the country’s 10 provinces, reaching 685,000 schoolchildren. The WFP warned early this year that Haiti would face new food security challenges because of the effects of the drought, tropical storm Isaac and hurricane Sandy which affected it in 2012. Environment Minister Jean François Thomas said in an earlier interview with IPS that, in conjunction with official reforestation plans, work is in progress to develop alternative energies that are less damaging to the environment and can alleviate the pressure on forest resources. Haiti’s total demand for crude oil and petroleum derivatives is met by Petrocaribe, a project that benefits 17 Caribbean and Central American nations that receive oil from Venezuela on preferential payment terms. But Haiti is also part of the Petrocaribe Energy Security Treaty signed in 2007, under which the parties committed themselves to developing projects to foment renewable energy. Deforestation is a direct cause of soil erosion, which increases Haiti’s vulnerability to extreme weather events like hurricanes, droughts and floods, that may become more intense every year as a result of climate change.